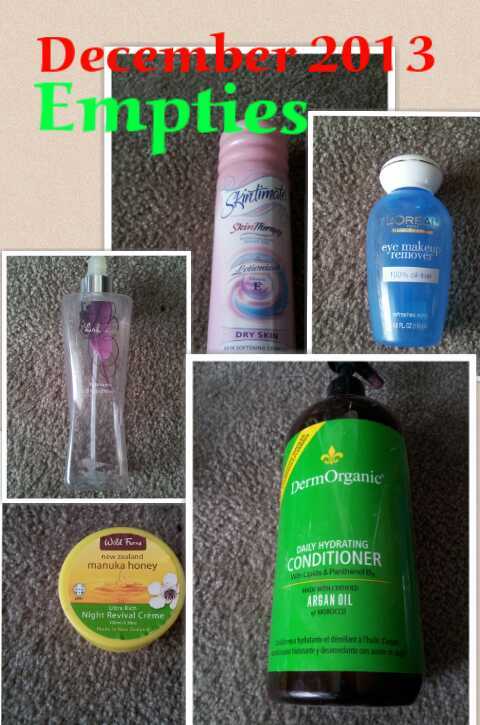 Here are the goodies I used up in December! 2) L’Oreal Eye Make-Up Remover. This burned my eyes. Won’t be repurchasing. 3) Bath and Body Works Dark Kiss Body Mist. It was okay, but not my fave scent. 4)Wild Ferns Manuka Honey Night Revival Cream. THIS IS MY HOLY GRAIL. In love. We reviewed it before here. 5)DermOrganic Conditioner. This was okay. May or may not repurchase. Right now I am using a Matrix Conditioner that I am really liking…so yeah. OK, probably won’t repurchase…there just made up my mind. 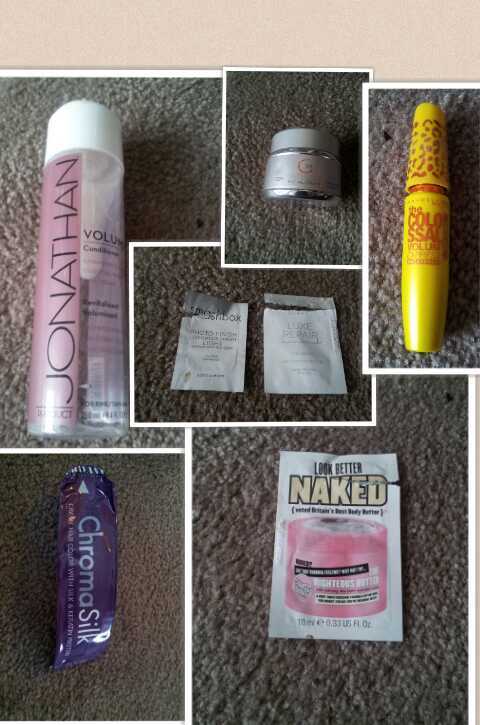 6)Jonathan Volumizing Conditioner. This stuff was the devil, will not be purchasing it again. And because I am weirdly stubborn and OCD, I had to use the entire bottle and hated it. Obviously, I have problems HA. 7)Glycolix Elite Facial Cream 20 Percent. Another HG product for me. My Med Spa friend turned me on to this, and I am hooked. Get it. You will be 40 and you will look amazing. Duh, of course repurchase. 8)Maybelline Colossal Volume Mascara. I liked this, for a drugstore mascara. Cover Girl is one my faves, but this may be a repurchase. Especially if on sale. I like sales. 9)Smashbox Primer sample . I’ve bought this before, and I have a sneaking suspicion this breaks me out. It’s never terrible, just a little small blemish here or there. I don’t buy this anymore, I stick with the Monistat. What? yeah. here. 10) Luxe Repair Sample from Julep. Face oil, meh. Not impressed. 11) Pravana Vivid Red – yes, Staple. I make my own color depositing conditioner. Interested? 12)Look Better Naked from Soap and Glory. OMG this smelled soooo divine. Yes, I will be buying this. I was so excited to receive the Michael Todd True Organics Pumpkin Mask in my August Ipsy Glam Bag because I haven’t used a mask that I haven’t cooked up myself in my kitchen in a long time. So yes, very excited. This is a rather generous sample of 1 fl oz. I expect it to last me a while. The Pumpkin mask is an exfoliating mask with a 5% Glycolic Acid and other enzymes. I exfoliate often and I get peels and microdermabrasions. I was pleasantly surprised that I was able to feel the telltale burn/tingle of the glycolic acid doing it’s job when I applied it. The color and smell, I can live without. It’s orange and pumpkin, and it sort of reminds me of baby food. If you get down with Gerbers, you will probably dig this smell a lot more than I did. On the upside, the smell fades quickly. This doesn’t dry cracked or uncomfortable, and it’s easy to forget you have it on your face. Also, the tingling fades away after a minute or so, and there is no discomfort. I love that this is organic! We hate putting a lot of chemicals on our faces, and are slowly shifting to a more natural beauty regiment. Does it exfoliate? Yes, but you need to do it a few times especially if your skin is used to harsher chemicals. I think this is a really nice compliment to my existing exfoliation/peeling routine that I have going on. It’s not hard to over do it on this stuff, and this is mild enough to use while I’m taking a break from my harsher acids. Side note – the highest % of a glycolic acid product I have is 20%. This mask smells so much like fresh pumpkin you will think it’s Thanksgiving. And exfoliant lovers will give Thanks! That tingle is the pumpkin enzyme combining with glycolic acid to go to town on your skin’s flaws dissolving impurities like dead skin and clogged pores. Adds brightness and radiance to the skin and significantly improves the appearance of fine lines and wrinkles after a single use. If you thought that masks were only for mature skin types…think again! The key to clearer skin is to unclog pores, reduce bacteria and nourish, tone and heal on and below the skin’s surface. Today’s masks from MICHAEL TODDtrue organics do all that transforming dull, lackluster skin into clearer irresistible complexions. 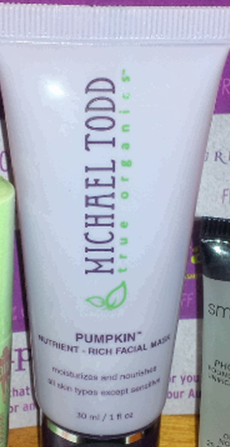 Have you tried any other Micheal Todd products? What did you think? Julep Maven Box!!!! My (Anna’s) FREE intro box. Kassi found out about Julep giving away a free introductory beauty box. We posted about it here, in case you missed it.